Open the doors to safe, affordable homes with hardworking Wake County families by sending season's greetings to family, friends, employees, clients and colleagues! 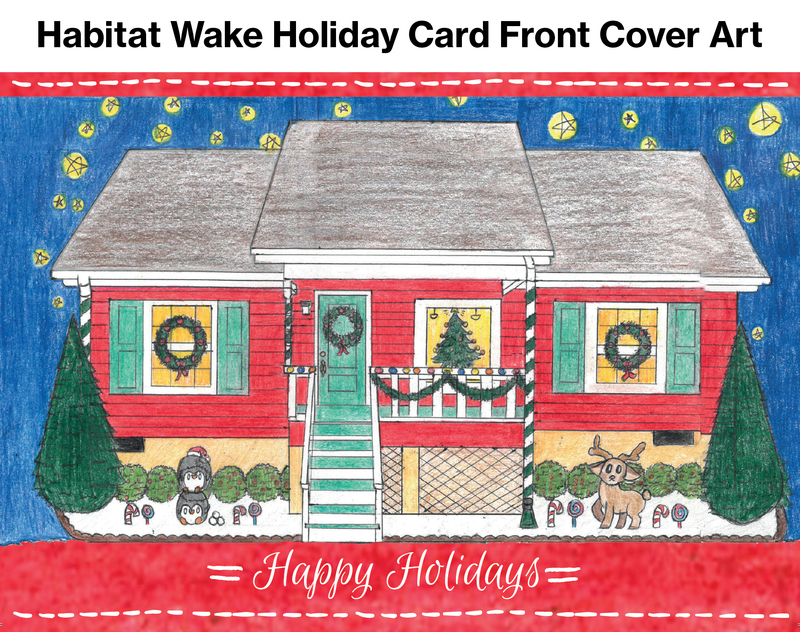 Purchase Habitat Wake holiday cards and help build homes for our neighbors in need. Honor cards are printed on high-quality, coated paper with matching white envelopes. A minimum donation of $5 per card includes a handwritten acknowledgement inside the card, printed return and mailing address on the envelope, and a first-class stamp. You may also choose to deliver your cards by email. Your honor card donation is tax-deductible. Standard holiday cards are also available. Sold in sets of 10, standard holiday cards feature the following inside message: "Warm wishes for a wonderful holiday and a happy New Year!" Click here to view a PDF order form. Ready to order? You may complete the order form below, or send an email to Nancy Bromhal or call 919.744.2402. For orders of 20+ cards, please call Nancy at 919.744.2402.